I just almost friended someone I haven’t seen in over a dozen years. Then I read some of his page and realized I don’t have the space in my (social media) life for his current level of cynicism. Then I realized what it was like to encounter me a dozen years ago and wondered what friends I might have now if I hadn’t been such a knucklehead. Sorry, everybody. You can friend me now. I’m still a knucklehead and occasionally cynical, but I think it’s much more tolerable than it used to be. At the time I posted it, I mostly was having a light-but-serious moment of introspection, both about how I judge other people now (which I do everyday – I’m a dirty judging sinner, but you aren’t, so don’t you dare judge me for being one) and about who I was and how I came across to others in another season of my life. By no means did I mean to imply that I’m free of the flaws and vices that entangled me back then or that I’m Captain Warmth N. Hospitality these days. I’m just self-aware enough to know that, by God’s grace and with much loving assistance from many people, most regularly the extraordinary woman and three little humans in my home, I’m not quite as abrasive and oozing angst as I was at various points in my history. So all of that was swirling in my head as I posted. In the background was an inner dialogue I’ve been having for years, but at amplified volume in recent months, about the real estate social media occupies in my life. In short order, one or two of the comments on my status tapped into that subterranean well of not-quite-coherent and woefully incomplete thoughts. I began to engage those comments with one of my own, then realized I was starting my seventh or eighth paragraph…in a facebook comment. Of course this is not unprecedented for me, but this time it seemed to make more sense to mutate that comment into something more – in length, at least, whether in substance remains to be seen. So here goes. I tend to believe social media is like almost any other “it” (non-living entity) in that it is value-neutral; it is not inherently good or bad. However, I think like all “its,” social media is riddled with potential snares. There’s no question that what someone has highlighted in these comments — the temptation to flippantly judge people’s lives and even “delete” them from ours based on what they post on social media — is one of those snares. Before I address that in particular, let me try to better explain my current struggle to discern the proper place for and use of social media in my life. I believe the snares of this particular “it” are multiplied and amplified by the staggering pace of social media’s emergence and the blinding speed at which it grows and changes. Most of us have gone from having little to no awareness of social media to allocating large chunks of space in our lives to it in a matter of only a few years. We all know people who give many hours of attention every day to social media – attention that a few years ago was directed at something or someone else, often actual work or people in their physical presence. We’ve all experienced “quality time” in a meeting or at lunch or in our living room with someone whose attention was at least as devoted to a 4×2 plastic rectangle as to us or the other humans in the room with them. And many of us have been those people. I have. I’ve also watched people I never would have imagined doing so begin to almost arrange parts of their lives either around their time on social media or around how they will convey the details of their day, both major and superfluous, to their “friends” and “followers,” sometimes including hundreds (or thousands) of people they never will meet. However innocuous it may seem, there is a transaction taking place in these moments and habits; we are investing some portion (usually larger than we realize, I suspect) of our time, attention, and possibly identity in a public representation of ourselves to people who are often removed from our lived-in-real-time-and-space lives by several degrees – a portion that inevitably cannot be invested in moments and with people who are, you know, in the room with us. We are finite. Every investment has an equal and opposite divestment. I am not trying to make an indiscriminate run at people who like these things more than I do. I’m incredibly flawed and prone to error in all of this. 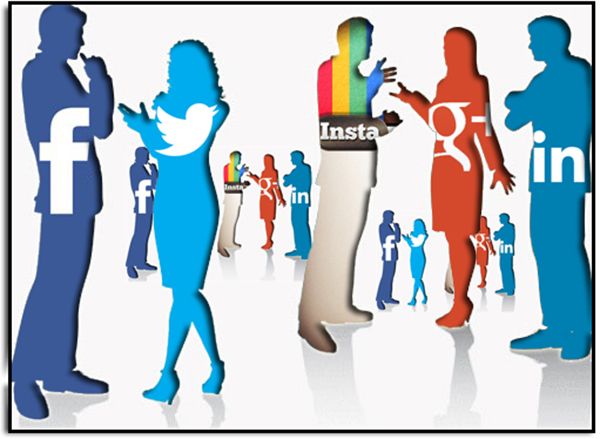 Wherever our habits or preferences, this is undeniable: as social media has exploded, we who interact with it have changed. And we have changed very, very quickly. Most historians, sociologists, physicians, psychologists, poets, and pastors will tell you that so much change so fast with so little reflection or discernment is almost always unwise. Unfortunately, many of our historians, sociologists, physicians, psychologists, poets, and pastors have so inculcated these particular changes that they do not have the time, inclination, or insight to prophetically warn us, “Hey dummies, slow down and take inventory of your lives and how you want them to be spent when you reflect on them in 30 or 60 years.” I am wrestling with my own culpability in the abdication of that responsibility. This discussion of social media, of course, is a subset of the way we have come to engage with the internet (which is a subset of a subset of other conversations), but it is a unique one in that it is so personal. We use “friend” and “defriend” as replacement verbs for “clicking a button on a screen.” We become “followers” of other people and accumulate our own “followers.” Some of us work very hard to grow our number of followers and, I’m convinced, get lured into the most obvious and literal evils of such an endeavor. We evaluate the events of people’s lives from thousands of miles away without ever having to look them in the eye. We have fights we never would have had without these tools (and by “tools” I mean social media outlets, not the people with whom we are fighting). We capture the most tender moments of our days, edit them with sophisticated photo software to make them look as appealing as possible, then seconds after they happen, share them with the world. Again, this is not all inherently bad, but it is a strange mix of personal and public that, a decade ago, most of us not only could not have imagined, but also would have thought was a bit weird. Maybe I’m old, but it all still weirds me out a little. Yet here I am with active accounts on three major social media outlets, not to mention my own website and the ubiquitous-among-Aggies TexAgs.com. And what I’ve realized is that, as leery as I am, I’m still prone to being deceived and distracted by it all in ways that aren’t altogether healthy. My life apart from social media is full of real people, real problems, and real joys. Seven or eight years ago, the real people, real problems, and real joys in my regular life were pretty much the whole of it. More recently, I’ve realized that even as I passively read the news feed on facebook or scan twitter or instagram, the people, problems, and joys of the people I encounter there are beginning to occupy internal space that used to house only a fraction of all of that. Look how popular the facebook lets me pretend to be! 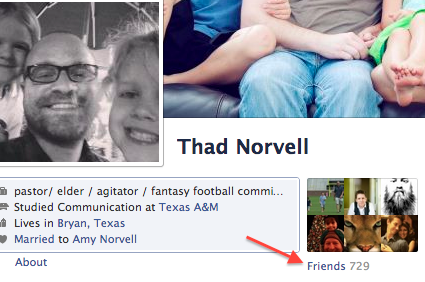 I mean, at this moment I have 729 facebook friends. That’s silly – so silly that I’m including a photo just to prove it’s true. There is no way that many people actually like me, and I certainly can’t maintain that many real friendships. I struggle to maintain 10-20 with the people closest to me. And yet because all 730 of us have entered this social media contract to be “friends,” I feel a subconscious emotional pull to allow space in my life for whatever piece of their lives they happen to type in a box on a screen or photograph with their phone. Even when I scoff and dismiss people for what they post (again, because I’m a dirty judging sinner), I still give time and energy to them and to their words and feelings. It still buys up one little piece of my day and my mind. That’s not all bad. Even on facebook, I’ve had some amazing reconnections and interactions with people I otherwise never would have talked to again about some very important things. I’m nostalgic and idealistic in ways that would surprise many given my external affect, and, at least internally, I’m painfully loyal. But I’ve also begun to passively assume that I have some sort of obligation to a lot of people who aren’t in my life aside from social media and, more to the point, a lot more people, problems, and joys than I have capacity. Everyone has to decide for him/herself how to manage that, but for me it has meant exercising more discernment in how wide my social media net grows. Honestly, the easiest part of that is the kind of decision that inspired my original facebook status, choosing not to initiate a social media “friendship.” This was just one example of that I chose to describe publicly because it was a humbling moment that taught me something about myself. To be fair, my compulsion to share that with 729 people may merit some lengthy examination. Often what transpires as I make these decisions is not nearly that deep, and it seldom has any more to do with the person I choose not to “friend” than acknowledging to myself that they either a) aren’t someone I actually was a friend to when we knew one another twenty years ago, and/or b) aren’t somehow meaningfully connected to me or the group of people I feel called to be engaged with in this season of life. Obviously the second of those criteria is highly subjective, but as much as I’d like to believe otherwise, I’m a highly subjective creature. The more challenging decisions come in other areas: responding to requests from people who don’t generally fit either of those criteria, occasionally having to decide how much energy to invest in an online interaction that matters a lot more to someone else than it does to me, and the like. What will be to some my darkest confession here is that I have hidden a fair number of people from my feed over time. I haven’t “defriended” many, but I have hidden more than a few. Of course I don’t want to be a jerk or hurt anyone’s feelings, but the truth is actually quite simple: I can’t do it all, even passively. I can’t absorb slivers of the lives of 729 people while still tending well to the people I encounter face-to-face every day and every week. I can do some of them, but not all of them. So my choice has been to either abandon social media altogether (or at least certain outlets) or exercise discernment in how I use it. For now I’ve opted for the latter, but the former is never off the table. Obviously part of that discernment is simply self-discipline, particularly choosing to use my time well and to be present when I’m actually with people. Yet even when I engage wisely and sparingly, I sometimes am overwhelmed by the lives and thoughts and feelings of people with whom I otherwise have no relationship and who post without me and my response in mind. I’ve concluded it’s not a sin or unfriendly for me to choose not to take in some of that (hence the hiding and such). I hope always to be ready to respond graciously and sincerely to any direct interactions with people and to moments and situations where it’s clear I’m supposed to engage despite having no logical reason to do so. Some of the best and most important moments of my life would have been missed if I blindly applied the criteria above to every possible interaction, so I have no desire to operate that way. I’m even prone to initiate some of those interactions, which means I’m occasionally on the receiving end of someone else not reciprocating my interest. And that’s okay. I’m just trying to exercise discernment and wisely apportion my time, my energy, my mind, and my heart. I don’t assume others will reach the same conclusions as they discern these things themselves. We’re all wired differently and called differently. And thank God for that. If there is an overriding value that I hope we can collectively embrace, whatever role we ultimately give social media, it is presence. As a natural introvert who loves quiet time alone, this is a lifelong lesson for me, and my heart is often ahead of my reality. Yet I’m utterly convinced that our presence with one another – physical, mental, emotional, and spiritual – is essential to our humanness; to our living. May we all be present and live.